Undoubtedly one of the nation’s most well preserved historic coaching inns, the existing Haycock Hotel reputedly dates back to 1620. 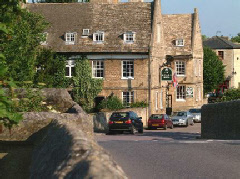 A landmark in the pretty village of Wansford, the hotel is said to have played host to both Queen Victoria and Mary Queen of Scots. It is thought that the latter would have done so en route to imprisonment at Fotheringhay Castle where she would eventually be executed (this, though, relates to an earlier incarnation of The Haycock rather than the building one sees today). Other notable figures reputed to have partaken of its hospitality include the poet Lord Byron, who is thought to have been a regular visitor while travelling between Nottinghamshire and London. With over 40 guest rooms its certainly a great deal larger these days than when the aforementioned queens would have paid a visit. It also boasts a restaurant with an AA Rosette: Orchard’s.